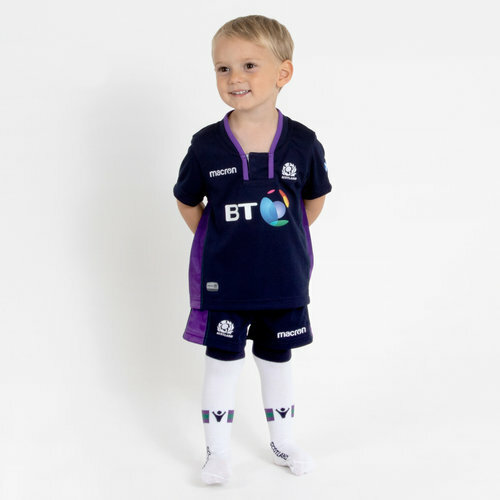 Show your pride for the thistle whether you're dressing casually or ready for action at Murrayfield in this 18/19 Scotland Infant Kids Home Replica Rugby Kit from Macron. This shirt is navy with purple and green detailing, inspired from the colours of the thistle. The shirt has purple under the arms and around the neck with green stitching. The Macron logo and team's emblem is on the right and left respectively. The team's sponsor - BT, as of 2014 - is printed across the chest. The Scottish flag is embroidered on the left sleeve. The shorts are navy with purple panels down the side. 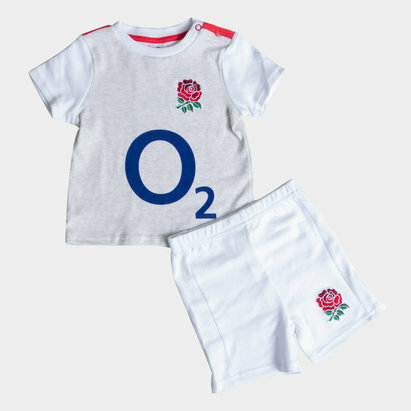 The Macron logo and thistle are on opposite sides of the shorts to the shirt. The socks are white with navy detailing.